Since joining the Pod Volunteer UK team I have loved learning about what the Child Care and Community Education team in India get up to but couldn’t wait to experience it for myself. I had volunteered in Ghana on the Child Care placement but had never visited India, so I was excited to experience this colourful and slightly chaotic country for myself. As a solo female traveller I had a few worries before arriving, but I shouldn’t have at all as from the first minute the team made me feel right at home and were a great support throughout. From teaching arts to our host family mother Neha’s chai tea – this is a very special project which will stay with me and I can’t wait to support more volunteers to come and join the team here. For the Community Education role I joined the local team and volunteers to work at a local primary school, situated a short rickshaw journey from the volunteer base. This is one of a number of primary schools the team work with and the local organisation are continuously looking to expand the support they give to rural communities in the surrounding areas. Schools in these rural communities are particularly underfunded and understaffed, with teachers being responsible for more than one class, therefore preventing students receiving individual attention. As most classes have a vast range of abilities, volunteers are key to running more focussed maths and English classes for children aged 7-11 years old. The long term goal is to increase the number of school children proceeding to high school, and noticeable progress has already been made in changing perceptions of education in these communities. You would not realise the barriers many face in attending schools from the enthusiasm the children have to learn! During my time at the project progress was evident; the class had only recently learnt the days of the week in English and were already rapidly improving their pronunciation. Gaining confidence in English has the potential to transform their employment opportunities in accessing English-speaking positions in the city of Udaipur and within their popular tourist detinations state of Rajasthan. Volunteers on the Community Education role in India can do much to support this learning process, by making sessions a fun and inspiring experience. For example, we organised a team competition to test the student’s spelling of animals and days of the week, they were soon eager to have a go at helping their team! Despite the limited resources available, volunteers can make their lessons as fun and creative as possible - flash cards and crafts activities are all ways for the students to improve their creative and communication skills. I was lucky enough to help the students learn how to use water colours for the first time, creating their own works of art to take home. 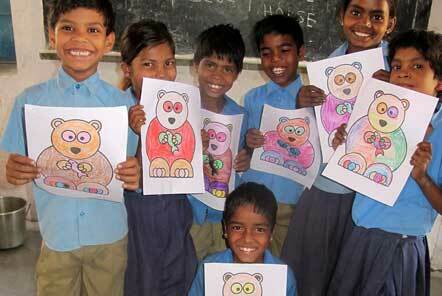 They turned out to be naturals at shading and mixing colours to create beautiful paintings. An experience they would not have otherwise gained, with staff limited in time and resources. I had a fantastic time volunteering at the Community Education project, it was amazing to see all that has already been achieved by the team so far. You can find out more about the volunteering role and how you can help support schools in Udaipur here!